The sinking of the RMS Titanic was a monumental moment in modern history. Even today, over a hundred years after the event, people are still struggling to comprehend the tragic irony of how the British passenger liner that was deemed “unsinkable” succumbed to a watery fate. 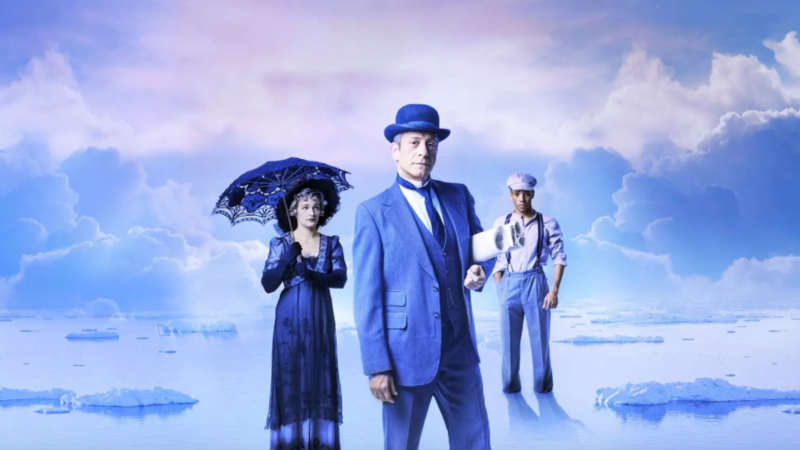 In honor of the Signature Theatre’s production of the musical retelling of the story of Titanic, we have compiled a list of other works of art inspired by the disaster. 1. The paintings of Ken Marschall. 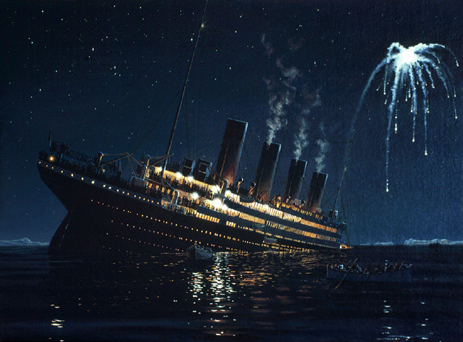 Artist Ken Marschall has made a career of depicting the ship, referring to his many realistic renderings as his “legacy.” Marschall is indeed renowned for having painted the Titanic in many forms, from sailing the Atlantic during the day, sinking at night, and lying at the bottom of the ocean. Because of his unique knowledge, Marschall has served as a consultant on several documentaries about the subject, as well as for director James Cameron on his famous film. 2. A Night to Remember by Walter Lord. Several books have been written on the disaster, many that detail specific subjects and perspectives related to the event. 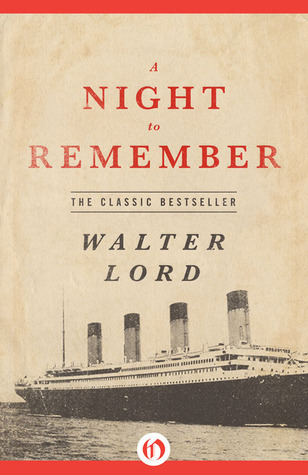 However, one book has remained the leading comprehensive historical account of the Titanic throughout the years: A Night to Remember by Walter Lord. What separates this book from many of the rest is that Lord seamlessly weaves interviews from survivors of the sinking into his emotional narrative. The first major motion picture about the Titanic was based on the book and bears the same title. 3. “The Convergence of the Twain,” a poem by Thomas Hardy. The great Victorian realist Thomas Hardy wrote one of the most memorable poems on the subject of the RMS Titanic. 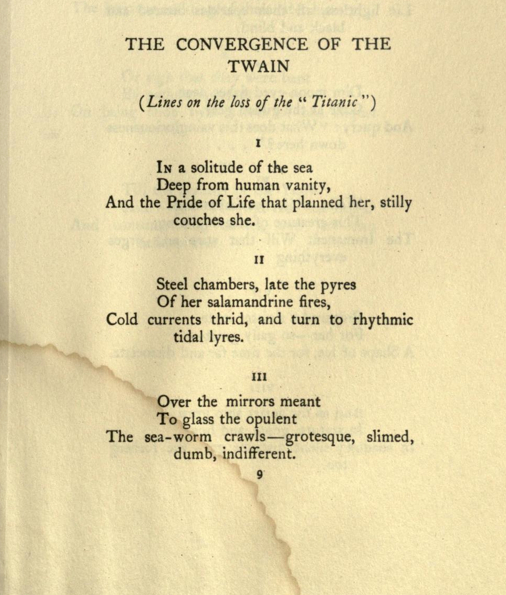 Unlike most of the poetry related to the sinking, Hardy’s writing focuses more on the ship, the iceberg, and the costly objects lost at sea than the poor souls who lost their lives that night. His poem calls attention to the fleeting nature and absurdity of opulence and vanity in the face of tragedy. 4. “When That Great Ship Went Down” by William and Versey Smith. Many songs have been written on the Titanic disaster, but perhaps the simplest and most mournful one is the repetitive and melancholy tune “When That Great Ship Went Down.” The song was originally recorded in 1952, but likely written in 1915, only a year after the Titanic sank. Above is a recording of the great Woody Guthrie’s take on the classic folk song. James Cameron’s powerful film Titanic was a world-wide phenomenon in 1997, and absolutely overshadowed the 2-part miniseries of the same name that was made just a year prior. It was extremely risky in scope and record-breaking in its costs, but made up for it at the box office and took home 11 Academy Awards. The film catapulted its stars Leonardo DiCaprio and Kate Winslet to international fame. This sweeping musical opened the spring of 1997, just a few months before the film would hit theaters. Titanic was beloved by audiences, Tony Award voters (it ended up winning Best Musical), and even Rosie O’Donnell, but unfortunately didn’t last very long on the Great White Way. Luckily, the tremendous musical has returned to the stage at the Signature Theatre. Don’t miss your chance to be a part of history and win $25 lottery tickets to see the Titanic set sail. Let us know if we missed any of your favorite Titanic-inspired art on Facebook or Twitter.